ITV News Business and Economics Editor Joel Hills explains why Primark is still booming and shows no signs of stopping. Primark has faced a backlash from fans of Veja trainers for its near-identical version and could be sued by the brand's founder. It is the biggest of the high street retailer’s 365 stores across Europe and the US. The store has recently undergone refurbishment. A Primark security guard allegedly pulled a child from her mother's breast during a row over breastfeeding. Associated British Foods (ABF), the owner of high-street clothing retailer Primark, has announced a 2 per cent rise in its adjusted operating profit to £1.16 billion for the year ending 13 September. ABF's results were boosted by a 30 per cent rise in Primark's year-end performance to £4.95 billion in revenue, which was built on its entry into new markets including France, according to the parent company. 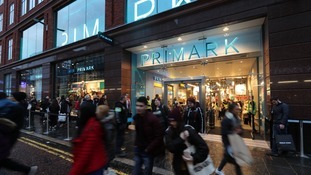 Sales at Primark were 17 per cent ahead of last year and like-for-like sales grew by 4 per cent. ABF also announced a 1 per cent increase in group revenue to £12.9 billion and basic earnings per share up 30% to 96.5p. Primark’s trading success and significant expansion delivered another magnificent year. Primark has now developed experience in establishing the brand in new markets and has achieved considerable trading success in each of them." A woman in Belfast is the third shopper to find what appears to be an SOS message in at item of Primark clothing. The handwritten note, which claims to be from a prisoner in China working under slave labour conditions, was reportedly found inside a pair of trousers bought by Karen Wisínska in a Primark store in Belfast in June 2011. Ms Wisínska said the trousers had remained unworn and in a cupboard until she discovered the message in them earlier this week and contacted Amnesty International. The message, headed "SOS! SOS! SOS!" reads: "We are prisoners in the Xiang Nan Prison of the Hubei Province in China. Our job inside the prison is to produce fashion clothes for export. "We work 15 hours per day and the food we eat wouldn't even be given to dogs or pigs. We work as hard as oxen in the field. "We call on the international community to condemn the Chinese government for the violation of our human rights!" Primark is to open stores in the United States for the first time as it looks to replicate the success behind a 26 percent jump in profits in the last six months. The retail chain, which has 269 stores across Europe, expects its first US shop will begin trading in Boston, Massachusetts, towards the end of next year. The US has been a notoriously tricky market for UK retailers to crack, with Tesco and Marks & Spencer among those to experience failure. Primark's new store in Boston will be in the Burnham Building in the heart of the city. High-street clothing retailer Primark has announced a 26 percent rise in its operating profit to £298 million for the past six months. The company has also made its first "long-term payment" to victims of the Rana Plaza clothing factory disaster in Bangladesh, owner Associated British Foods said in its half yearly report. ABF urged other retailers who source clothes from Rana Plaza to donate to a trust fund "so that it can pay out in full to the remaining victims". Tomorrow will be the first anniversary of the disaster, in which more than a thousand people were killed.